This is one of the classic of chinese snacks. It is not my favorite snack to eat but somehow the quest to make a soft and tasty one has been going on for quite awhile. Have tried a few recipes, easy ones and tedious one but all the results went to the Culinary God. This recipe was from Claire, a dear friend and is by far the best of all that is why i am sharing it. Thank you Claire for typing out the recipe and sharing. Wash the rice-8-10 times in cold water and leave in a clean tupperware container with 2 inches of water over the surface for 2 days. Change the water daily. Mix yeast with 1/2 c.tepid water(85 f to 100 f) and add 1/4 C. sugar. Cover and place in a warm place when you do the next step. Bring water to high boil. Put the greased 8 inch cake pan and warm it for a few minutes. Lightly stir batter and pour half the batter into the greased pan. Lightly rub a little oil to give it a glossy appearance. Repeat steaming for the other half of the batter. This paeng must be very popular cos there were 2 requests for the recipe. I can recall the name but somehow cannot remember how it should be. When i was in San Fransisco, i asked for it in the bakeries, the ppl at the bakery replied that they have not heard of anyone asking for Kong So Paeng for the longest ever and looked at me as though i was Rip Van Winkle, who slept for 100 years. Now that i have made it, i know why this paeng did not stay in my memory, it has no significant smell or taste.. I would like to thank Seadragon of Corner's Cafe who found this recipe for me. 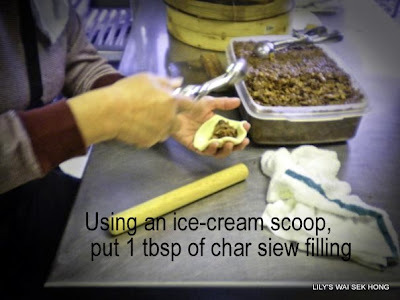 Reserve the required portion for this recipe and store the rest in an air tight container and freeze. Thaw to room temperature the next time you want to use the dough starter. Mix the starter dough with sugar, lard, eggand evaporated milk, until well combined.. Add in the flour and mix until a dough forms. 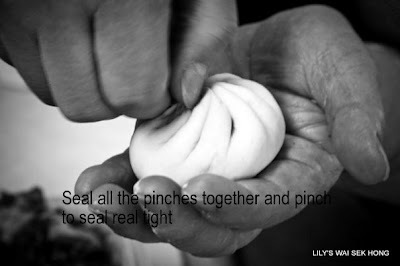 Lightly knead dough and let dough rest for 30 minutes and longer if the room temperature is colder. Divide dough into balls (size of your choice). Flatten balls and put into lined baking tray which has been sprinkled with flour..
Let dough rest for another 15 minutes, sprinkle with flour and put into preheated oven to bake. Bake for 10 - 12 minites, do not let paeng brown, the aim is to get white milky paeng. Cool paeng and store in air-tight container. Kuih Bom Keledek translated from Malay to English is Sweet Potato Bombs. These would one of the items prohibited to be hand-carried on to a plane,cos of it's namesake. They are so called for it's round shape and no relation to any explosives but they do explode a mouthful of flavors when bitten into. Any variety of sweet potatoes/yams can be used and i like the orange colored yams as they give a golden look to the balls. 1/4 cup or more dark brown sugar(adjust sweetness to your liking) - cook it with 1/4 cup water until sugar dissolves. Mix grated coconut, sugar solution and pandan leaves(if using) and cook over the stovetop or in the microwave until well combined and thickened slightly. Remove the pandan leaves and add in the glutinous rice solution and mix well. Cook further until the glutinous rice is totally cooked and thickened. Taste and adjust sweetness. Mix the all-purpose flour and the glutinous rice flour together with the mashed sweet potatoes. Add in water a little at a time until a dough forms. 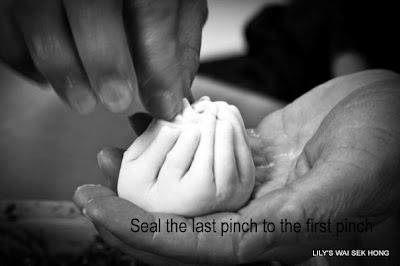 Knead until it is smooth. 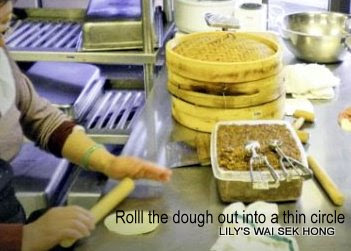 Divide dough into 1 inch balls. Flatten a ball and fill with 1 tsp of coconut filling, bring the edges together and seal well. Repeat until all the balls are done. Heat vegetable oil to 350f. The name given to the Capsicum fruits varies between English-speaking countries. Read about it under Synonyms and common names at Wiki. To know the names may be of great help especially now that there are so many recipes online and it could be from anywhere on this earth. When i was asked if i knew how to cook Chili, i answered that, yes, i do use chilly to cook and due to my ignorance, my answer must have been perplexing, just as the question was intriguing to me. Add shrimp to a food processor, using the metal blade, process for a few seconds, until shrimp is pasty, add in seasonings and process until paste is well mixed. . Set aside while you prepare the sweet pepper for stuffing. Use a paring knife and make a slit on all the sweet peppers, then stuff the peppers with the shrimp paste. Heat a little oil and pan fry the stuffed peppers with the shrimp paste down touching the oil and fry until brown. Do not crowd the pan, fry in batches. Put the stock, oyster sauce and soya sauce in the wok and bring to the boil. Thicken with the cornstarch/tapioca starch solution. Add in pepper. Put the cooked stuffed peppers into the sauce and cover the wok to finished cooking the shrimp paste. Remove cover and sprinkle with sesame oil. According to the believers of The Goddess Nüwa, She created human beings on the seventh day, by molding them from clay, so today is our birthday - HAPPY BIRTHDAY. 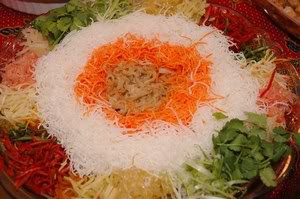 A drink from seven types of vegetables is made for health and to celebrate this occasion. 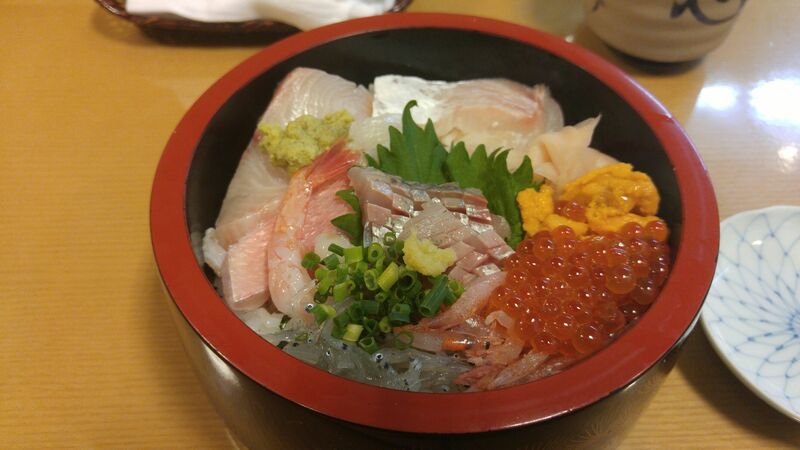 Noodles are eaten to promote longevity and raw fish for success. Since i had 'yee sang' on New Year's Eve, i will have noodles today. Heat wok with enough oil for deep frying.and when oil is 375f, drop one piece of dried noodle in and deep fry noodle until golden brown. Remove and plunge fried noodle into a large pot of cold water. Marinate meat slices with the marinate and set aside. Heat wok with 4 tbsp oil and brown marinated meat slices. Add in chopped garlic and saute until fragrant. Add in stock and seasonings, bring to a boil. Add in deep fried noodles/yee mein and bring to the boil. Reduce heat, cover wok and simmer noodles until noodles are soft. (Add more stock if you want more sauce). Add in choy sum and increase heat. Cook until choy sum is cooked just right. Thicken sauce with tapioca starch solution. Make sure the sauce is back to the boil and cook for 1 minute before adjusting the taste with salt and pepper. Divide noodles into 4 portions and put each portion into a small claypot. Bring back noodles in claypot to a quick boil and crack in an egg together with a dash of shao-xing wine and sesame oil before serving. 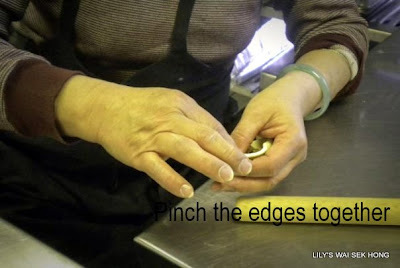 Serve noodles immediately so that the egg can be cooked through from the heat of the noodles. When i was shredding taro for Yee Sang, i remembered this snack. I shredded more taro and made this forgotten snack which was so crunchy. The taro is sometimes called the "potato" of the humid tropics and indeed it is - a good taro will be fluffy in texture just like the potato. Taro is quite costly and choosing a good one which will be fluffy is crucial to your pocket and the dish you will be preparing. For a good fluffy taro, choose one that is shaped like a vase - narrow on the top and bottom, wide in the middle and it has to be as smooth as possible - no bumps or knotches. Bumps mean that the taro has been constricted from growing well and that it has been grown in muddy soil. Taro grown in sandy soil, grows well and will be fluffy. I have given up buying taro with skin on and have been buying peeled ones, although peeled ones are very much more expensive, at least i can see that the taro will be fluffy and not rotten. 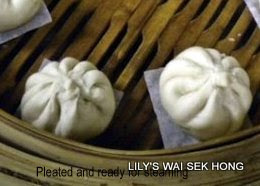 There are many more recipes that i would like to try - like Or Nee, Taro Cake, Taro Filling for mooncake and many more. Mix all the ingredients, followed by a little water to bind ingredients. Heat oil for deep frying and when oil is 350f, using the chopstick, pick up a little taro shreds and deep fry till golden brown and crispy. Drain well and let cool before storing. I have been watching this Pau Pleating Video for umpteen times and still not able to pleat as pretty. The saying is true - Hard to teach old dogs new tricks. These pictures showed that i tried and perhaps i will have to make more than 360 paus to really pleat well. Would like to share how our friends enjoyed tossing the Yee Sang. It was such fun and i am so happy that we can enjoy and experience the Chinese New Year in this auspicious way. Thank you dear friends for coming to my home and ushering in the New Year. After all the feasting during the Chinese New Year Celebration, Renee and Alexander were very happy just to have plain rice with seaweed. Pack warm rice into moulds and then decorate with seaweed. Wishing all A Happy Valentine with this Nin Ko and may this sticky rice cake provide the bond and keep all your love ones together. These are all the prep needed to complete the Yee Sang. With this dish, i would like to wish all 'Gong Xi Fa Cai", "Koong Hei Fatt Choy" Happy Chinese New Year and remember to toss - "loh" high which in cantonese "loh hei" for the possiblity of a more progressive year to whatever you do.